Mure Media provides a wide range of branding and digital marketing services. Our service-based approach makes a team of experienced marketing professionals available to your team on retainer (fixed monthly fee). This approach allows you to leverage knowledge and talent without a long-term employee commitment. Think about it, what would it cost your firm to hire a dedicated marketing strategist, creative director, a designer and a web developer full-time for an entire year? When you work with us, you gain access to a team of talented marketing professionals at the fraction of the cost of a full-time employee. We can work with you as consultants, or as a full virtual team, and everything in between. 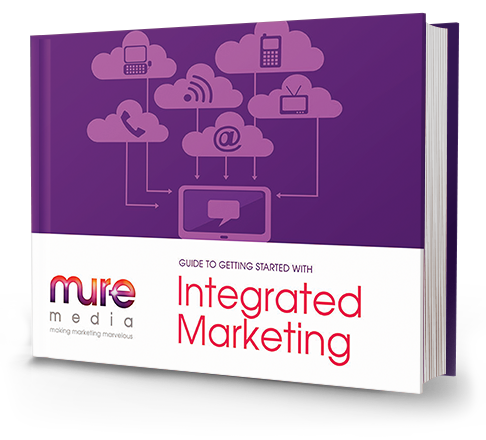 This ebook outlines the fundamentals and power of integrated marketing and provides a guide to improving your overall marketing program. Each month, our Virtual Marketing Department helps businesses like yours develop a relentless dedication to bottom-line results (ROI) for a fraction of the cost of full-time marketing staff. Marketing is absolutely essential to the success of a business. It is not a matter of IF you need a marketing team, but how soon you can get it. And the days of getting by with your administrative staff attending to your marketing needs, is long over. Successful marketing requires expertise across a wide range of skills, such as visual design, writing, technology, metrics analysis, and so much more. Effective marketing requires a strategy focused on your core customer’s needs, and how you solve those needs. Increasingly, marketing demands a 360 degree view of your customers’ involvement with your brand, from first contact to life-time value. We can be your entire marketing department or help develop your team’s skills internally to assure they are heading in the most profitable direction. Our goal-driven design methodology puts a premium on getting started quickly, tracks each action taken, and makes adjustments and improvements month over month. Engaging Mure Media is like having a high-powered Marketing Department right at your side, guiding your every step . . .